Review: Scott Pilgrim Vs. The World: The Game Review - This Is My Joystick! Movie tie in games are normally not that good. Ok, that’s an understatement; 99% of games which are related to movies are just plain bad. Luckily, the game based on Scott Pilgrim Vs. The World is not among this very bad group. It does have one or two issues, but overall it has to be one of the best beat-em-ups to come out in the last few years. It is truly a KO. If you haven’t picked up the plot line from the barrage of the film’s marketing, Scott Pilgrim is a twenty something slacker/bass player living in Canada. He meets, quite literally, the girl of his dreams in Ramona Flowers, American roller skating Amazon delivery girl. However, in order to date her he must battle her seven evil exes. Unfortunately, this is effectively all the story the game gives you and most of that comes from the attract screen at the start. 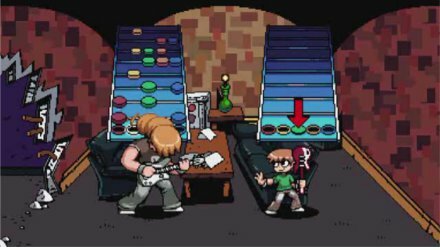 It is quite evident from this point alone that the game is designed for people who have gained their knowledge of Scott Pilgrim from other sources and are playing the games as an accompaniment. The game plays just like nearly every other brawler. You, and up to four of your friends fight your way through screen after screen of enemies in order to progress to the boss battles that finish every chapter. There are seven chapters in total and each has several areas within. To fight, you have the usual block, jump, light and heavy attacks. Each character also has their own special move as well as a striker which calls in Scott’s stalker Knives Chau and whose effect varies depending on the character. These special attacks drain “Guts Points” which also allow players to stand back up after running out of HP. The levels you fight through are all themed around the associated evil-ex and so rapidly change from one level to another. They are jam packed with items to use, shops to buy accessories and food from and waves of bad guys. It also has a levelling system, much like the game River City Ransom, so as you fight you unlock several extra moves up until the level cap at sixteen. This levelling system in some way accounts for the tough as nails difficulty; make no mistake, this game is designed for co-op. It is still do-able in single player but expect lots of shouting and screaming at your TV. Scott Pilgrim is packed full of funny references to some classic games. From the Mario style map screen to the copies of “Never-ending Fantasy” and “Spikey the Porcupine” in one of the in game shops, it buzzes with an old school feel. It also harks back to the gaming days of old in other ways, the game is brimming with reasons to play back over and over again. There are no collectables but many achievements require several playthroughs in order to unlock. There is an additional character that requires the game to be played through once with each character and an unlockable striker that will require some perseverance just to get into the fight to unlock it. The game also has a boss rush mode and a survival zombie mode, both of which are unlocked by cheat codes input at the start menu. My favourite thing about the game has to be the 8-bit esque graphics by Paul Robertson. They capture the comic’s art style perfectly and are a much better fit to the source material than any poorly rendered model of Michael Cera. Every tiny animation is packed full of detail and character, from Scott’s victory celebration to the look of glee on Kim’s face when you attack an enemy with a baseball bat. It’s a delight to see in motion and with four players and a screen full of bad guys it’s a visual feast. The backgrounds are also beautiful pixel art while some animated interludes really help to convey the game’s link back to the comic. It has inherited some of the weirdness from Robertson’s other work but doesn’t really suffer as this is a world where pretty much everyone seems to be a champion fighter. I’m also in love with the soundtrack. It’s all written and performed by the chip tune band Anamanaguchi. 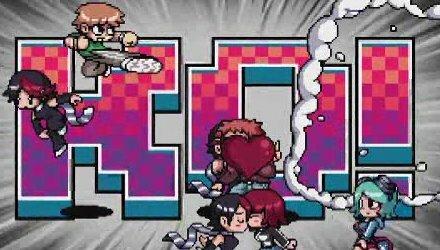 It’s a great rocking soundtrack that combines screaming guitar with 8-bit sound effects to create a sound like the game’s Scott Pilgrim is inspired by while also adding a modern twist to it. However, chip tune music can be a little abrasive so if you aren’t a fan you might have to play with the music turned off. The rest of the sound effects sound like improved versions of sounds from other games which is another tribute the game throws out. Got four friends? Time to fight! I mentioned before about this game featuring co-op. It supports four players who choose one of the four characters to play as. Unfortunately, this co-op is only on a single console. The lack of online seems a rather weird decision; I don’t know whether this was a design decision or simply a lack of time. I have heard people saying it will be patched in but I wouldn’t get your hopes up. However, I think it’s great as a co-op game apart from the levelling system. Just like in Castle Crashers there will be situations where the players are all at different levels which can lead to frustration. Get past that and it’s a joy to play. It’s among the most fun four people can have in one room with their clothes on. Scott Pilgrim Vs. The World: The Game is one of the best games made to tie in with a film’s release. 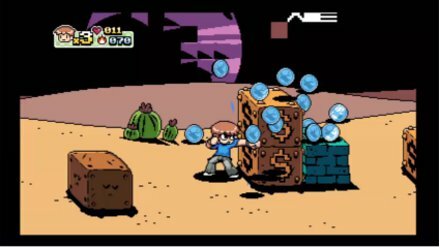 It captures the spirit of both the comic and book, takes the references from both and moulds it into a game as fun as other modern brawlers such as Castle Crashers. The lack of online co-op is a major issue for a modern release but the rest of the gameplay, as well as the replay value means this is a great package. Add to that its cheap price (800 points on XBLA and £6.99 on PSN) and it’s a truly great game. 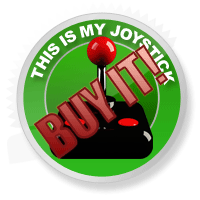 Buy it now and start collecting some loose change.